Daniel Radcliffe is an English actor, who rose to fame with his portrayal of Harry Potter in Harry Potter films. Some of his other prominent works include The Woman in Black (2012), Kill Your Darlings (2013), and The F Word (2013). 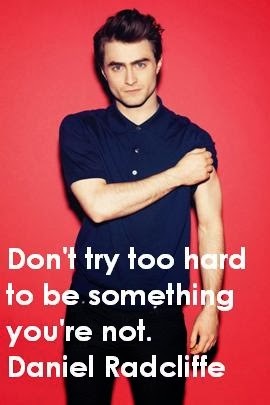 Here I have compiled down some of the popular Daniel Radcliffe quotes on love, life, happiness and success. Just hope you will like the quote compilation and find some of interesting Daniel Radcliffe quotes to share with your friends. Go boldly and honestly through the world. Learn to love the fact that there is nobody else quite like you. When you get as lucky as I got, you have to work as hard as possible to earn that luck. There's no shame in enjoying the quiet life. And that's been the realization of the past few years for me. I think of myself as being Jewish and Irish, despite the fact that I'm English. That's what fame does to you. You acquire another self. I used to be self conscious about my height, but then I thought, f**k that, I'm Harry Potter. You don't have to be gay to be a supporter. You just have to be human.